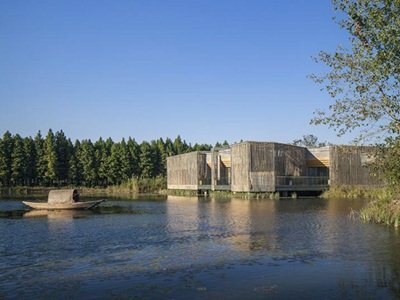 Located in the ShiQiao garden in Yangzhou, a city to the northwest of Shanghai, there is a floating Bamboo Courtyard Teahouse designed by Chinese architect Sun Wei, partner of HWCD. As an international design practice with offices in Shanghai, London and Barcelona HWCD has developed a broad variety of projects, specialising in boutique hotels, residential and mix-use developments. HWCD’s projects try to emphasize the existing “worldwide interconnectedness” of the architecture and design spheres by bringing together traditional Asian aesthetic and a more modern design language. The Bamboo Courtyard is an example of the HWCD design philosophy, embracing traditional Chinese garden design fundamentals while blending into the natural environment. The bamboo is arranged vertically and horizontally to produce a “depth” to the buildings fabric, it also allows for the buildings skin to change and morph as you move through the space. Tall rows of bamboo form the corridors along the outdoor walkway and are organized in asymmetric fashion on the lake. Traditionally, Yangzhou courtyards are formed with inward facing pavilions, creating a landscaped courtyard space. Drawing inspiration from this, the bamboo courtyard was designed from a basic square footprint, the form was fragmented into small volumes creating an internal landscape area. Each of the spaces has views into the surrounding lake, with each room afforded a unique vista of the internal courtyard. From the exterior, the bamboo courtyard is a cubic form with a variation of solids and voids. The strong verticality becomes more apparent at night when the teahouse lights up to illuminate the surroundings. The simple form illustrates the congruent blending of architecture with nature. Moreover, the natural materials such as bamboo and bricks provide sustainable sensibilities. The voids in the outer skin improve natural ventilation within the bamboo courtyard while the thick brick wall retains heat in winter, reducing the dependency of mechanical heating and cooling systems. Tea is one of China’s most precious cultural heritages and has remained popular for thousands of years. A traditional Chinese tea ceremony requires an unassuming setting in order to appreciate its lengthy process. The bamboo courtyard provides the ideal surroundings for this experience, emphasizing the underlying importance of design and architecture.